Join "Colors of Pomegranate" photo contest organized by Pomegranate Producers and Exporters Association of Azerbaijan! To participate in the contest, just send your photo on the "World of Pomegranate" subject to [email protected] from September 15 till October 15. 10 best photos will be selected by jury and get a chance to participate in the contest. 10 photos will compete for three top spots with cash prizes of 2000, 1000 and 500, respectively. 4. Submitted photos can be further used on PPEAA’s informational catalog, various websites and social pages. 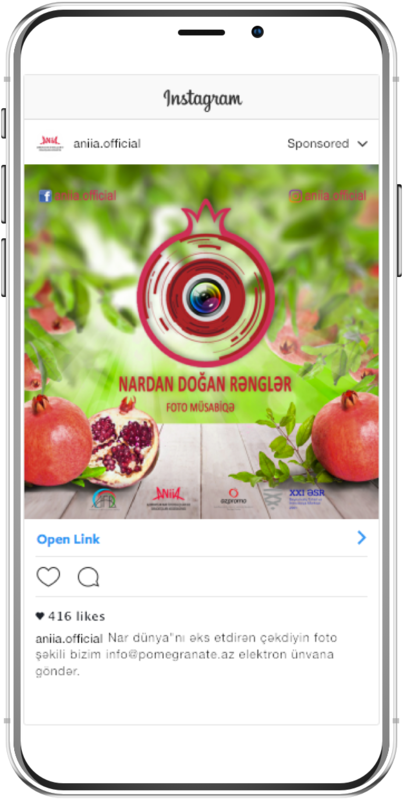 The award ceremony will be held by Pomegranate Producers and Exporters Association of Azerbaijan at the exhibition of the photos participating in the contest. For additional information, please call +994 50 711 70 77. Azerbaijan Pomegranate Producers and Exporters Association wishes good luck to all participants!